C130 Work Platforms – Petersen Inc. 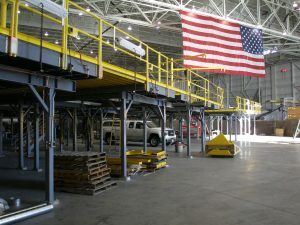 These work stands provide maintenance access to the C130 transport aircraft to facilitate depot maintenance at Hill Air Force Base. This fabrication effort is built to customer supplied designs and drawings. The interface against the high value transport aircraft is critical to avoid damaging the aircraft and safety risks to the workers on these stands. Handrails, stairs, and moving platform sections of these stands are OSHA compliant safety devices for the work force that operate from them. Structural fabrication and painting were accomplished in our Pocatello, Idaho facility. 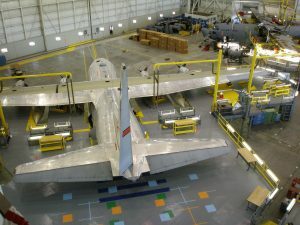 The stands were then transported to our warehouse location in Ogden, Utah to provide just-in-time delivery to the customer for installation at Hill AFB. Customer satisfaction resulted in two follow on procurement actions after the first delivery.